In many of today’s high-speed and lightweight applications plastic components succeed where metal formerly served. Cam followers using plastic, high load capacity composite rollers are a maintenance-free alternative to traditional metal designs. These cam followers are designed to transmit motion and carry load in today's high-speed and light-duty machines in medical, packaging, and semi-conductor equipment. Using plastic-composite rollers they are the best choice for many applications including cleanroom operations. Two possible sources of contamination – excess grease and metal particulates due to metal-on metal contact are eliminated due to the self-lubricating material of the roller. Traditional metal cam followers are built for high loads, yet in many applications are used to transmit motion, not for their load bearing capacity. Rail or cam surfaces must be hardened and a manual or central lubrication system must be provided to protect the bearings and rail from failing. The plastic cam followers are a cost saving alternative, providing years of maintenance free operation without damaging rails, especially aluminum. 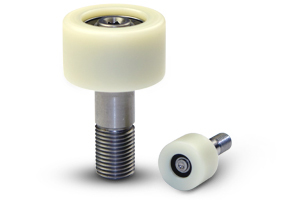 The cam follower design includes a Stainless Steel shaft and lubricant free plastic roller where precision ball bearings are enclosed and lubricated for life. Call us today about your application, other materials and custom designs are available to meet your specific need.